The shirts are still on sale. The minimum number of products that need to be sold for items in the campaign to be printed has been dropped to 5 items. Check below for details and linkson each campaign. If you see a campaign you want but not the color you want let me know! If five people want the same shirt but different colors and/or different style, I can create another campaign just for you. Keep in mind, all of this is to help out a GTer who is in need of some help. If don't want a shirt but would like to help out directly, I will have some more information available on that later. Remember if most of the campaigns can exceed the original goal amount by at least 10 then a portion will be donate to the GT Fund. Be on the lookout for more shirts that are Feminism or GT themed! There is a new group of Raffey shirts available. It includes a yellow long tee, a red regular tee, a black hoodie (cause its getting cold outside), a pink women's tee, and a baby blue v neck. This campaign needs 4 more items to be reserved before it can go to print. 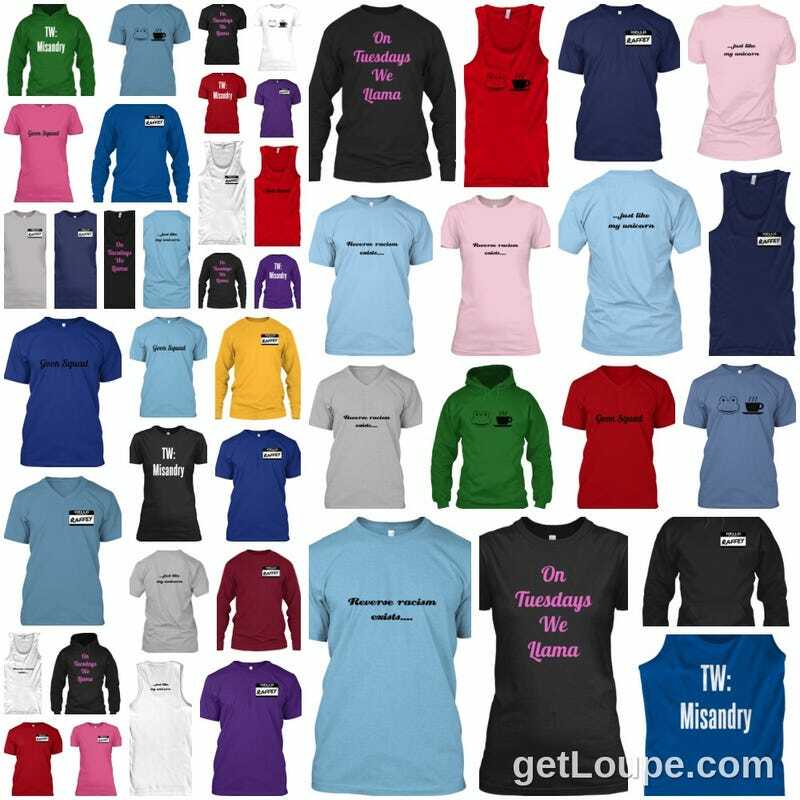 The 2nd most popular shirt so far, TW: Misandry campaign is going strong. It includes a purple long tee, a red regular tee, a green hoodie (cause its getting cold outside), a black women's tee, and a blue unisex tank top. This campaign only needs 4 more orders for it to hit the original goal! Educate people that reverse racism still exists just like unicorns. It includes a baby blue regualr tee and canvas tee, a gray v neck, a pink women's tee, and a white unisex tank top. This campaign 5 orders before it can be printed! Sip Tea campaign is waiting on you to order. It includes a blueish regular tee, a baby blue v neck, a green hoodie (cause its getting cold outside), a white women's tee, and ared unisex tank top. This campaign needs 5 orders to print! Goon Squad T-Shirts! The amount of people claiming to be Goon Squad members should easily make this the most popular shirt. It includes a blue regular tee, a red v neck, a baby blue canvas tee, a pink women's tee, and a red unisex tank top. This campaign needs 3 more orders to print! Another set of Raffey shirts here: It includes a dark blue canvas tee, a purple regular tee, a darkish red long sleeve tee, a dark blue women's tee, and dark blue unisex tank top. This campaign needs 5 orders before it can print. The original set of Raffey shirts here: It includes a purple canvas tee, a darkish blue regular tee, a blue long sleeve tee, agrey women's tee, and white unisex tank top. This campaign needs 5 orders before it can print. The most popular shirt so far, On Tuedays We Llama campaign is still going. It includes long sleeved tee, a regular tee, a hoodie , a women's tee, and a unisex tank top. All items are black with pink lettering. This campaign only needs 3 more orders for it to hit the goal!